The 19th edition of the World Cup in South Africa witnessed Spain winning their first world title. The World Cup will be remembered for quite a few things but there are some which will remain in the memory for long. We, at rediff.com, bring you the five most memorable things/events from the 2010 World Cup. 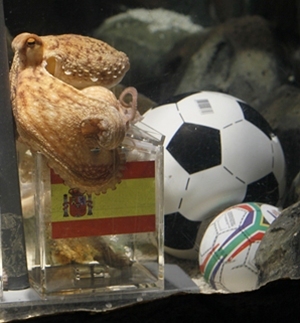 This oracle octopus in Oberhausen aquarium turned into a global celebrity for correctly picking the winners of all seven of Germany's World Cup matches -- including their two defeats to Serbia and Spain. Paul picked Spain to beat the Netherlands in the World Cup final in a live television broadcast watched across Europe and the Spaniards were so grateful that they renamed him Pablo. And he was right. Spain beat the Netherlands to take home the trophy for the first time. That made Paul's record cent per cent. He made predictions for eight matches and got all of them right. The two-year-old celebrity octopus, who was born in England, however incurred the wrath of Argentine and German fans following his correct predictions. There was enough support from Spain though. Love it or loathe it, vuvuzela did make their mark at the World Cup in South Africa. The organizers were adamant that the vuvuzelas would not be banned despite the fearsome din they made. 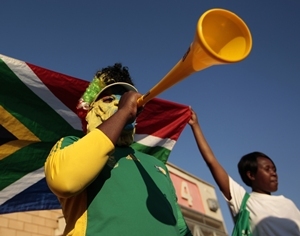 "Vuvuzelas are here to stay and will never be banned," Rich Mkhondo, a spokesman for the local World Cup organising committee was quoted as saying. "People love the vuvuzelas around the world. Only a minority are against vuvuzelas. There has never been a consideration to ban vuvuzelas." The plastic trumpets, which can produce about 200 decibels of noise, had been controversial since the Confederations Cup last year, a World Cup dress rehearsal, when several players complained they could not communicate through the din, which sounds like a herd of charging elephants. FIFA President Sepp Blatter rejected calls for them to be banned, saying they are as typical of South African football as bongo drums or chants in other countries. The vuvuzela industry is worth 50 million rand ($6.45 million) in South Africa and Europe, according to Cape Town-based Neil van Schalkwyk, who developed the vuvuzela seven years ago. And they ensured an increase in the sale of earplugs. Raymond Domenech's six year tenure ended in such a disgrace that it caused uproar in France. Sports minister Roselyne Bachelot castigated "the disaster of the national team made of immature gang leaders in command of scared kids." 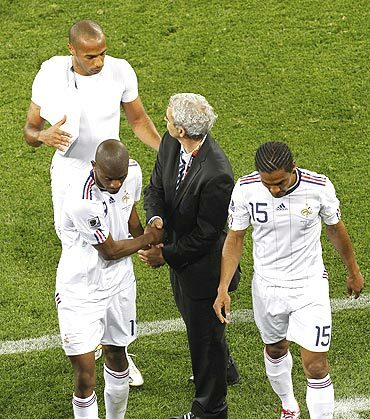 William Gallas, a 32-year-old central defender who started all three group games of Les Bleus' South African campaign which ended with a first round exit and was marred by scandals off the pitch, blamed it on the coach's inability to communicate with the players. "The real problem was the coach. We suffered from a communication problem. Domenech was not open to discussion," he said. There was a boycott of a training session in support of striker Nicolas Anelka sent home for insulting the coach at halftime in their 2-0 defeat by Mexico in their second group game. "We wanted to protest against the decision taken by the coach and the Federation particularly because the coach said Anelka had not been kicked out because of his insults but because he had refused to talk about it afterwards," added Gallas. Post the debacle Laurent Blanc has taken over as the coach of France. She has been dubbed as Paraguay' s 'Biggest' fan. The lingerie model became a sensation when she announced she would run naked through the streets of Asuncion if Paraguay won. The 24-year-old said she would shed her clothes and run "with my body painted with the colors of Paraguay." La Albiroja went out in the last eight, losing 1-0 against Spain. However, Riquelme has decided to keep her promise, saying it was a present to the players for trying their level best. "It will be a present to all of the players, and for all the people in Paraguay to enjoy, because they tried as hard as possible and gave it their all on the field," the Daily Telegraph quoted her as saying. Her fans are eagerly waiting for the D-Day. From doing Laundry Service to begin with, Shakira has come a long way. And her Waka Waka This time for Africa became the anthem of the World Cup. The song wasn't without controversy though. Taken from an old 1986 song by a Cameroon musical group called Golden Sounds, it means: Come and do it. Shakira's version has been controversial because she didn't know it was from Cameroon but sounded "african" enough to "compose" a song with the same rythm and lyrics, being that it was a BIG hit in Colombia in 1986. Shakira recorded the song and a composer has been trying to sue her because he says he wrote the song back in 1986 (he actually had plagiarized it), after that, the original composers demanded a compensation, but there's nothing clear as to how much they will be awarded. To the fans in general the controversy hardly mattered. Shakira's name means 'thankful' in Arabic and her fans are indeed thankful to her for gifting them this song.